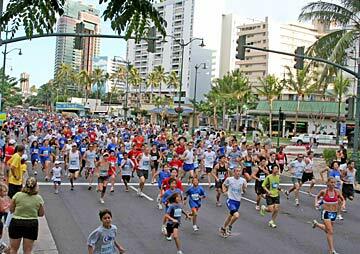 A large pack of runners took off at the start of the Niketown 5K road race in Waikiki on Sunday. The Hawaii basketball team could fill its vacant assistant coach position as early as today, UH head coach Riley Wallace said. Wallace forwarded a recommendation to athletic director Herman Frazier and hopes to have the new coach join associate coaches Bob Nash and Jackson Wheeler on the Rainbow Warriors staff this week. A position opened up when Bob Burke left UH to become an assistant coach with the Portland Trail Blazers after two seasons with the Rainbows. The deadline to submit applications was last Thursday and Wallace said he received about 12 inquiries into the job. The new assistant would be in place in time for the start of practice next week, when the UH men's and women's teams open workouts with Twilight Ohana. The event, formerly known as Midnight Ohana, will be held Oct. 14 at the Stan Sheriff Center. In past years, teams were allowed to begin at midnight of the opening day of practice. The NCAA rule was changed this year to allow teams to start at 7 p.m. the night before. "By having it earlier, I hope we'll get a little better crowd," Wallace said. The theme for this year's event is "Night of the Stars," with players and coaches dressing up as their favorite celebrities for the team introductions. Gates at the Sheriff Center open at 5 p.m., with a carnival on the arena concourse and a concert starting at 6. The team introductions are scheduled to start at 9, followed by the 3-point shooting contest, and the slam-dunk competition. The teams will hold scrimmages to close the festivities. Two wins last week kept Hawaii's Western Athletic Conference record perfect and kept the Rainbow Wahine at No. 11 in yesterday's CSTV/AVCA Division I Coaches Top 25 poll. Hawaii (9-6, 3-0) received 829 points, 30 behind No. 10 Notre Dame. There was no movement within the top 11, with Nebraska (13-0) remaining at No. 1 with 58 of 60 first-place votes. Washington (12-0) kept its No. 2 spot with the remaining two first-place votes. The Rainbow Wahine continue their WAC season this week, hosting Fresno State on Friday and WAC co-leader Nevada on Saturday. Both matches are 7 p.m. at the Stan Sheriff Center. >>Brigham Young-Hawaii senior Yu Chuan Weng was named as the AVCA Division II National Player of the Week. The 5-foot-9 outside hitter led the Seasiders to a 1-1 record last week with back-to-back 33-kill matches. Weng averaged 7.61 points, 7.33 kills and 4.11 digs per game, and she hit .318 in the two matches against Hawaii-Hilo. BYUH (13-1) moved up one spot to No. 21 in the Division II national rankings. Hawaii Pacific (12-1) rose from No. 7 to No. 5 in the poll. Larry Stubblefield shot a 2-under-par 70 yesterday to take medalist honors in the qualifying round of the Aloha Section Turtle Bay Golf Match Play Championship. Stubblefield had a 3-under 33 on the front nine. He is seeded second as the tournament moves on to the match-play portion. Defending champion Brian Sasada, who didn't participate in the qualifying round, is the top seed. Stubblefield won last year's senior division. Ron Kiaaina Jr., the 2002 senior champ, won senior medalist honors yesterday with a 1-over 73. He is also the top seed. The tournament continues with quarterfinals and semifinals through tomorrow's 18-hole final. The University of Hawaii coed sailing team opened its season with a second-place finish in the Danmark Trophy hosted by the U.S. Coast Guard Academy last weekend. The Rainbows finished with 261 points, nine behind Boston College's 252. Seniors Bryan Lake and Meredith Adams finished third in the A division with 124 points. They had six first-place finishes. Senior Eric Oppen and freshman Cailin Hill placed seventh in the B division with 137 points and three first-place finishes. As expected, the Big Island Interscholastic Federation announced yesterday that it will make up the football games that were called off over the weekend due to forecasts of inclement weather. The games will move to the weekend of Nov. 4-5. That means the semifinal playoff games originally scheduled for that weekend will not be played. In the original format, the second- and third-place teams in Division I and II met in an elimination game, with the winner meeting the top seeds. The state tournament begins on the following weekend.